Summer in Stowe, Vermont usually conjures up images of hikes through the Green Mountains, leisurely drives down country roads, dips in swimming holes... What is often overlooked is the wide variety of musical performances in the Stowe area during the summer months. Whatever your taste in music: classical, jazz, funk, musicals there is something for everyone. Stowe is home to several performing arts groups that offer concert series indoors and out; as well as free performances and moderately priced events. 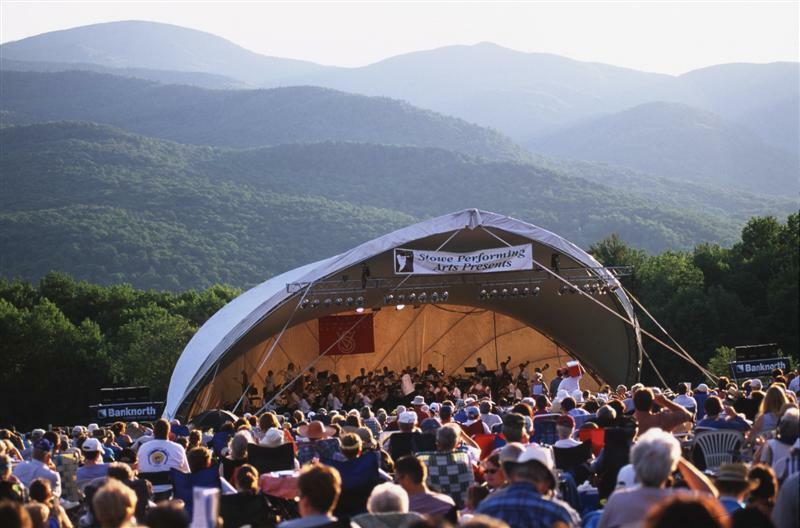 Opportunities range from concerts on the grounds of Trapp Family Lodge with the sunset over the Green Mountains in the background or performances in the elegant, state of the art Spruce Performing Arts Center. Looking to stay in the Village after dinner in town? Stroll over to the gazebo on the green for a free Tuesday night concert. Musical theater more your style? Don't miss the Stowe Theater Guild summer performances in the Town Hall most weekends in the summer. Travel just north of Stowe to the village of Hyde park to enjoy a performance by the Lamoille Players in the historic Hyde Park Opera House. Or check out the state capital and enjoy a presentation by Lost Nation Theater in Montpelier.